Being a former Close Protection Officer (CPO/Bodyguard) for one of the world’s Top 10 Billionaires/Forbes Top 5 CEOs, Scott is no stranger to performing the complex and intricate executive protection detail tasks involved in protecting high-profile financial tycoons. Scott currently provides armed protection for a renowned spiritual advisor to influential world leaders, and is assigned to the advisor’s Spec Op Security Team detail. He provides armed protection for a national traveling CEO, his place of business, and oversight of high-risk terminations. He also performs high-value transport, coordinates logistics of said transport, provides armed close protection for those clients to/from residences, as well as while traveling to different locations, private events, and hotels. In addition, he is an accredited, certified, and insured firearms instructor. He has taken over 338 hours of firearms instruction, paid for out of his own pocket, to ensure his students receive a conglomeration of training techniques taught by Special Forces unit group members from all over the globe. Scott's passion lies in protecting his clients and making every effort that they get home safely to their families, as well as teaching others and helping them ascend to their next level of training. As CEO & Director of Training at C.O.R.E. Firearms Training, Scott's responsibilities encompass developing, leading, and instructing Active Firearms Training™ courses for carbine and handgun. Courses consist of dynamic weapons manipulation, in a myriad of diverse scenarios. 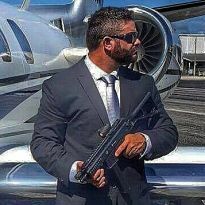 If you or your company are looking for a well rounded, licensed, armed professional Executive Protection Close Protection Operative, or real world applicable firearms training, please contact him for availability. Private 1 on 1 training is available, as well as group training.